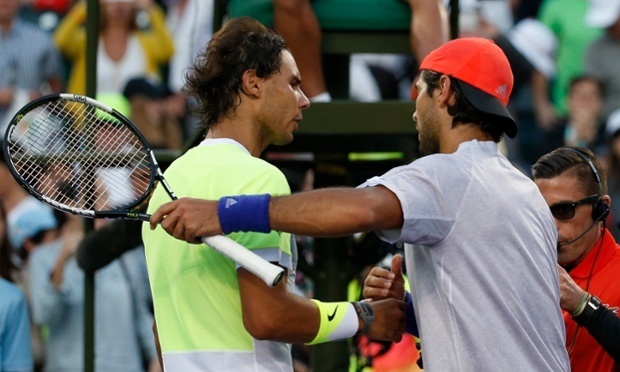 I was excited at the prospect of the Verdasco-Nadal match-up in the third round of the Miami Open. Flashbacks of the 2009 Australian Open semi-final came back to my mind, one of the most exciting, thrilling tennis matches I’ve seen! The start of the third round match wasn’t bad. Some flashes of good tennis from both players. Verdasco’s up 5-4, Nadal to serve. And this is when things go bad for Rafa. Easy forehand unforced errors from Nadal offer a set point on a golden plate to Verdasco . The rest of the match is a good performance from Verdasco but a roller coaster, up and down performance from Nadal. He was averaging one forehand unforced error per game. I say forehand. Easy ones. Some went in the middle of the net. Some were too long. Some passing shots he used to make eyes closed barely came out of his racket. When he’s nervous, I feel like Nadal gently strokes the ball rather than hitting it savagely, powerfully like he used to. In the press conference after his defeat, Nadal, very candidly, said he struggled mentally during the match. It is too early to wonder whether it’s the beginning of the end for Nadal. Miami open has never been his strength, and the clay season is coming. Back in 2010, when Federer was at Nadal’s current age (28), people were wondering whether Roger Federer was over. Five years on, at 33 years old, Federer is not winning Grand Slams like he used to but he is still a serious contender and is still feared by his rivals. Now it’s Nadal’s turn to be 28. To turn 29. The difference between Nadal and Federer is that the younger player has already been through many injuries and came back throughout his career. We all talk about the physical impact this has on his body, but did all these injuries strain him mentally? If so, will he ever recover?